Way back in the time we know as 2013, myself and Stewart K. Moore collaborated on a wee short for Zarjaz we had to call Jurassic Farce. 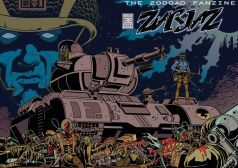 It saw Judge Dredd tackle a dinosaur outbreak in Mega City 1 in his own inimitable style, and rendered in some stunningly detailed artwork from Stewart. I'm turning the blog over to Stewart for a guest post where he'll provide his very own artists commentary on Jurassic Farce, and maybe even point out some details you may have missed. In 2012 I decided to test my hand at drawing a sci-fi comic. I wanted to see if I could do an action style comic strip. It’s one thing to draw individual pictures well and quite another to maintain the continuity and style of imagery over several pages of a logical (or illogical) comic strip. Not easy. I am for the most part a painter but I have written and illustrated my own strips for publication before. Morris Mule, Taxidermist for example was a surreal tale about a disoriented British ex-pat in Prague and recently I concluded a series about an alien zombie-clown epidemic titled ‘The Bozo Explosion’ . 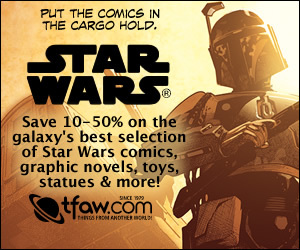 But both stories are cartoonish in style and the latter an anarchic dig at weekly news. I wanted to see if I could sustain a more high-level thing, something a bit more…well…um…’Dredd’. So I wrote to Bolt, the (very possibly alien) editor over at Zarjaz and he gave me a Paul Penna script to illustrate for FutureQuake entitled Projections. Bolt later sent me some Dredd based scripts too. Of those, Jurassic Farce’s fast paced, incessant, hilarious and downright mental energy leapt out at me…it was also filled with burning dinosaurs. Dinosaurs! Burning! So anyway, I saw a real challenge ahead because I didn’t know if I could draw a dino very well either. In fact I didn’t think I could. The finished visuals work but have many flaws…many. Still, over all, it holds up. The energy is there and I think I sustained it throughout, just. By the way, just as I was starting the breakdowns I read up on some of the most recent palaeontology research and dinosaurs, it seems, were often feathered, so I incorporated feathers in to my work, that’s why a few of the beasts have a slick vulture-like feathering here and there. I must say this helped with the suggestion of movement some. I should point out also that what I did on JF was a bit mad. Too much, too crazy, too fast and too detailed - WAY too detailed. I also made compositional choices that were kinda bananas. I did this strip for the love of it and although Zarjaz is A5 I designed it so that each panel could be explored on full screen desktop computer….and that too was nuts. But I had fun and I think that it comes across as intense (which I think any big city dinosaur outbreak would be)…I think it’s fun to look at and I think the choices I made mostly worked. Although, once again, my initial sketches trumped some of the finished panels. They had an energy in some cases that I failed to transfer from sketch to ink. Sigh…so it goes. Lee's story is of course satirising the Steven Spielberg directed film Jurassic Park released in 1993 (which I think is now on it's 4th sequel). The film is based on the Michael Crichton book from 1990. Great idea, right?...only it's not unique to Crichton. Now I've said this before (and I'm willing to be proved wrong, so pipe up dear reader, if you know otherwise) but I think the idea of a dinosaur theme-park based around the concept of DNA extraction and cloning from fossil creatures (...only to place them in a circus/park/prison) was the invention of Pat Mills in 2000AD. Pat Mills introduced dinosaurs into the Dredd universe in The Cursed Earth saga, an excellent example of world building that itself had something of a Damnation Alley feel, but it goes way the hell beyond that film. By the time of this adventure the park has been long abandoned and over-run by it's dinosaurs. So we find them roaming the landscape as yet another post-apocalyptic threat in the hell-zone formerly known as The United States. And that's why they are extant in Jurassic Farce. It's gets a bit stranger. Some years ago I read a script for a new TV show, again a production of Steven Spielberg and again I found myself thinking of the early days of 2000AD. The script was for Terra Nova and it featured a group of humans who go back in time to live among the dinosaurs. Terra Nova is based on an idea by Kelly Marcel and is available on Netflix. But this too was similar to an idea of Pat Mills that he wrote before the Cursed Earth story. In it people have gone back in time to harvest food for a hungry future population. So in this vision of the future we are not only responsible for the environmental collapse of the present but also that of the prehistoric past. 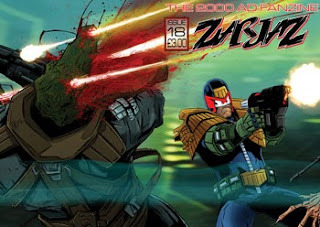 The story is called Flesh and has been running in 2000AD since 1977. I think these are both firsts that could and should be attributed to Pat Mills....but hey, I could be wrong. One last thing, these two stories are related. There is a direct genetic link between 'Cursed Earth' dinosaurs and those of the 'Flesh' story, The genetic material of a prominent T Rex in 'Flesh' is replicated by scientists running the park in the Judge Dredd story (before societal collapse). That's something like an 85 Million year gap before the ‘Son of…’ sequel - another first! Who knows but I’d guess if you are determined to work in comics as a writer or artist you should really contact fanzines and do all you can to work with them, just do as much as you can with fanzines while you try and get a paying gig with a comics publisher. You’ll meet and work with people and deadlines in ways you can’t prepare for in any other way and the sheer thing of doing it will sharpen your game in many ways. My recent comics have been published in three UK fanzines and two poetry and art anthologies in the US. But for a budding comics artists the important thing to ask is - Can I do this? And the only way to know is to throw yourself in at the deep end with a fanzine. The answer to getting started is - getting started. Consider it your training. You can do anything you apply yourself to. Time and commitment will improve your work. Just be prepared to start at the bottom of the ladder and work harder than anyone else and hopefully opportunities will open up. For me the comics that always had the most life were ones filled with background activity, what Will Elder and Harvey Kurzman called ‘Chicken Fat’. It’s no coincidence to me that one of Louie Mall’s finest films owes much to the frenetic background antics of Elder’s comics. The film I mean is Zazie. We moved in that direction here, I think, and I’m very pleased to have worked on the strip. I think Lee did a smashing job of creating something sharp and fun with a lot going on and room for me to go nuts on the background action. I hope you enjoy it. Projections will be re-published in the next issue of 100 Percent Bio-Degradable. Four pages of initial roughs, my first pass so to speak, at illustrating the script. The last of which is an attempt to tighten inked panels where I thought they could be strengthened. I did this by setting up a new page and cutting in to areas of the panels that I felt could be dropped and were slowing the flow down by taking us off the focus. It's a fine line, I wanted mad detail...but great flow and for the leader to know where to look. Just as I started sketching the panels I was asked to provide mugshots for Sector 106 from Tinman Games. This aborted sketch for Jurassic Farce became one of those mugshots. This scribbled leap effort bothered me for weeks. I spent a long time trying to figure out how to make an effective heroic leap. More than one of those in this picture have paid a visit to the Ugly Clinic. In this group we have an 'Ugly' and a copy-cat of Citizen Snork, a 'Fatty'. A 'Call-Me' era droid and (lost to the speech bubble) a former Titan prisoner. In the background I also placed a character who was part of an anonymity trend generated by a criminal syndicate, the story was drawn by Ron Smith circa 1984. I was pleased with the power of the explosion. The man in the foreground and in particular the woman in the background still clutching her handbag. Here the T REX has begun its flaming rampage by tearing apart a dog walker. The persons legs are in its paw, torso in its mouth. A dachshund is swinging by the lead still hanging from his masters hand. Dredd in sillouhette against the flaming circus vehicle. A burning corpse at his feet and a tiny dinosaur running amok behind him to further accentuate the T Rex scale. Many dino's were actually quite small like this one. Before Dredd can take on the T Rex he is blind-sided by a beast half its size. Something a bit Cam Kennedy-ish happened here. I quite liked this happy accident. Dredd is stepping out from the corpse of the dead dino to see another coming at him like a truck. I wanted to layer events, so as to accentuate the chaos. Here we have a dino destroying a gangway, people running in fire, Judge Dern euthanising a dinosaur, Dredd arriving while re-loading and the committed terrorist continuing to issue diabolic commands while still burning from the initial explosion. His concussed companions meanwhile bleed from the nose and ears. 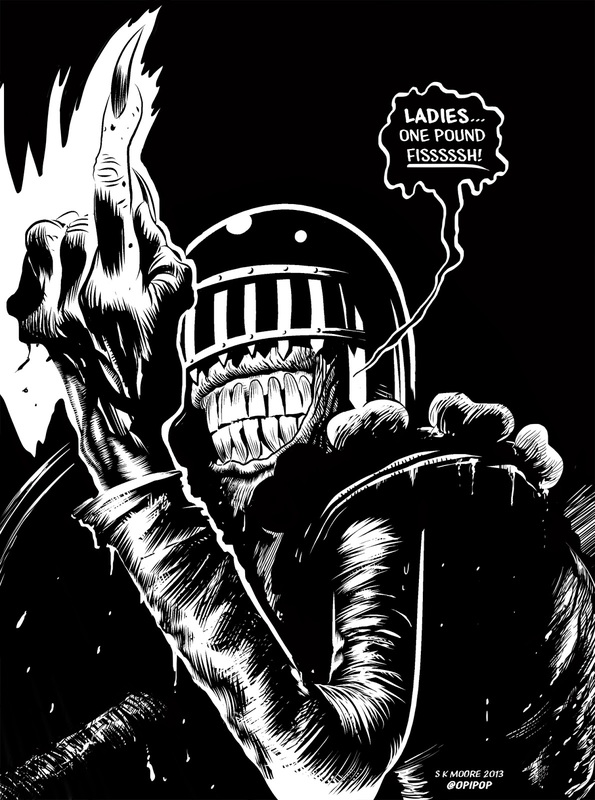 It’s flawed but I liked the speed and intensity of this panel with Dern being a very strong character every bit the equal of Dredd. Himself riding hell for leather after the T REX...with his ride still clutching part of a terrorist that it had previously chomped down on. Dredd doesn't tip. Leaping from his ride Dredd makes sure to dispatch it fairly permanently. Falling body parts from the ravenous man eater. But also, in the foreground confusion a face, a woman’s sheer terror flashing at us through the dust cloud. The Judge Death I drew for 'Dethan Taxi's' Necropolis Ghost Tours. Apologies to Lee, a terrible pun that he had nothing to do with. Example pages re-cut to change or enhance the panels. A very, very big thanks to Stewart for taking the time to do this guest post. Be sure and check out his blog and follow him on Twitter.